OWINGS MILLS, Md. – Lost in all the noise of the loud month in the league's loudest locker room is the man who knows how to shout as much as any of them. Everyone has paid so much attention to Ray Lewis' last run and the Baltimore Ravens' bellowing, screaming defense and Joe Flacco's sudden passing brilliance that Ray Rice has become almost an afterthought. Usually this is hard to do. Usually Rice is the loudest Raven of them all. Usually he booms around the other Baltimore players shouting about whatever it is Ray Rice shouts about. 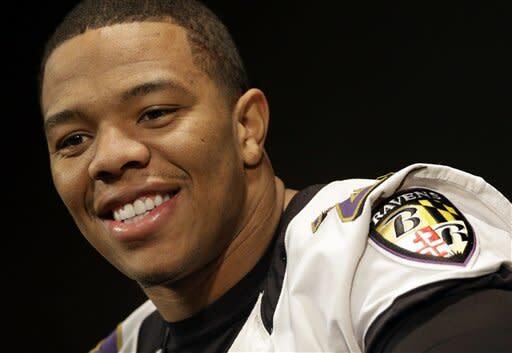 And everybody watches him and smiles because that's Ray Rice and he's always shouting about something. Like the night of the AFC divisional-round game in the playoffs against Denver a couple of weeks ago when the Ravens beat the Broncos in two overtimes in a nearly zero-degree chill. When the locker room finally opened to reporters, Rice stood in the doorway and shouted to those rushing past: "We welcome you all who doubted us!" Yeah, that was Ray Rice, all right. Always with something to say. Always the center of the room. He had 131 yards rushing that night, and he even gave fans the Mile High Salute, which was the trademark of the Broncos' great running back, Terrell Davis. This was his second-best postseason game in a career where the postseason has not often worked out. There have been fumbles. There have been defenses collapsing around him, cutting off the avenues through which he could thrust his 5-foot-9, 212-pound body. 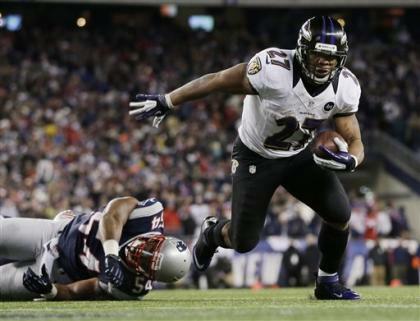 The playoffs have been his frustration as teams learned the best way to stop the Ravens was to stop their running back. But now comes the Super Bowl, and a week that should be all about Ray Rice is instead going to be about other teammates. When the players gather in the ballrooms for the traditional interview sessions each day, the biggest platforms will be given to Lewis and Flacco. The conversation will revolve around the passing game that seems to have finally emerged for the Ravens in these playoffs. Little of the talk will be about Rice. The irony in all this is that Rice seems the ideal player for Super Bowl week. He loves the attention. He has a compelling life story with the murder of his father in a drive-by shooting when he was 1 and the death of the cousin who was a father figure, killed by a driver he has been told was drunk. In another year, where Ray Lewis wasn't retiring and Flacco wasn't suddenly starring, Rice would soak up the cameras. People will still come to see him. They will still ask him questions. He is still a star on a team of big personalities. And when asked about the Super Bowl this past week, he all but glowed. "First off, you have to embrace it," Rice said. "I'm not going shy around and say this isn't the best feeling of my life. It was just one of those feelings where the game is over and it finally set in that the Ravens are going to the Super Bowl, so you have two weeks to prepare. Obviously, we are going to enjoy this. Obviously, we are going to get to work this week, but you get down there, there's nothing like it. I said I have never been to a Super Bowl game. I have been down to a few Super Bowl appearances, but I told myself I'm never going to one unless I'm playing in it. This is the one that I finally get to say I'm playing in it." Somehow you have to think he will have some kind of impact on Sunday. There's no logical reason to think this won't happen. Opponents didn't even average 100 rushing yards a game against San Francisco's defense this year. The Niners crush almost everybody's run game. And yet for the Ravens to probably have a good chance against the 49ers' pass rush, they are going to need Rice running through whatever open lanes he finds. In the biggest game of his life, he is going to want everyone to watch him. Right now, Rice has been less impactful than in other years. This past year was his least productive with 1,143 rushing yards in the regular season. It was still a very good 2012, one many running backs would have loved to have had, including a miraculous fourth-and-29 catch and run in San Diego that might well have saved Baltimore's season. But it wasn't a Ray Rice kind of season. Not the way that we expect. He still is very young, just 26 years old. He has a long football life ahead of him, but it is clear the Ravens are not going to be as dedicated to handing him the ball as they once were when defense dominated everything for them. If this postseason has shown anything, it's that Flacco and his fleet of fast receivers are the future of the franchise. Baltimore is going to throw. It won't just be giving the ball to Ray Rice forever. The other day, the retiring Lewis was asked about Flacco, and Lewis talked about how the Ravens were going to need a new leader. He suggested Flacco was ready. And yet there also is a sense that he could have been talking about Rice as well. A lot will depend on who plays well in the Super Bowl. Sunday, the Ravens could really use him. The 49ers have a furious pass rush. Flacco probably won't get the same time to throw as he did in the previous three playoff games. Baltimore will have to run. It will need Ray Rice. Chances are he will be there waiting.